Well, for this dish it is exactly how I was feeling. 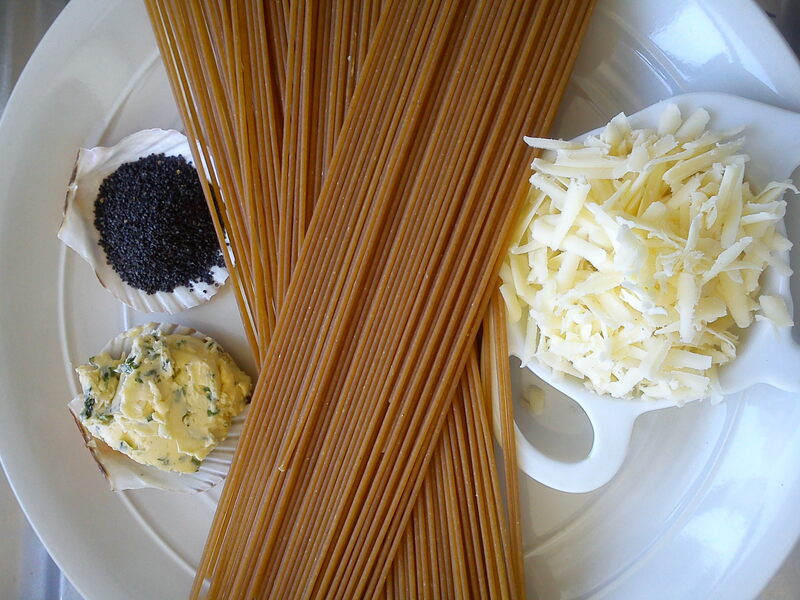 All I needed was 10 minutes, some whole wheat pasta, poppy seeds, grated cheese, garlic & herebs butter ( I make my own). Start by making the garlic butter (can keep for two weeks). Take 150grs of your preferred butter (preferably unsalted butter); leave it at room temperature to soften. Once soften mash the butter as if mashing some mash potatoes with a wooden spoon until the butter look like some sort of paste. Take 3 cloves of garlic (I love Garlic) peel and very finely chop them, add to the butter. Take about 6 branches of parsley – Chive would make it too garlicky. Finely chop your parsley and add it to the butter too. Mix well until the butter, herbs and garlic form a single mass. Put the mix in a ramekin, cover with cling film and put in the fridge to harden. In a pot of boiling water ad salt and your spaghetti. Leave to cook to your taste. Mine takes 5 minutes. Drain and serve immediately. Add the garlic and herbs butter, the cheese and the poppy seeds. Uuuuuhhhhhhhhhuuuummm! It was a lazy day. So simple it is sinful. Nothing else needed here. Please note… do not make this too often and make sure that your meal for the next 5 days are well balanced, and with less fat.